Friendly, passionate, conscious foodies. We source quality, fresh ingredients & serve delicious wood fired pizza! ​Plant based and made from scratch; Bomba brings good vibes offering a delicious vegan friendly catering service at events, markets, festivals and functions in and around Melbourne. Our ingredients are fresh, meat free, dairy free, locally sourced and organic wherever possible. We offer a range of 100% dairy free cheeses, mock meats and use sustainable and environmentally friendly packaging. Fully equipped with our marquee, collection of antique nics and nacks including a 1950's cash register, trestle ladders, and of course the rolling barn... our wood fired oven! 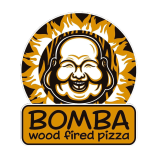 Bomba offers a delicious, conscious and unique catering experience for private events, food truck parks, markets, expos, festivals and more! We offer a fully vegan catering service to a range of Melbourne events including markets, festivals, food truck events, private events, birthday catering, party catering, wedding catering, engagement party's, corporate events, family fun days, sporting events, expos, car shows, charity fundraisers and cultural events.